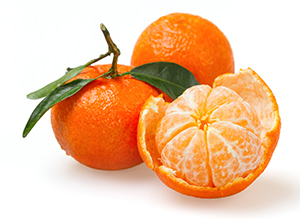 The Page tangerine fruit is small to medium, orange/red, has few to many seeds, and produces in large numbers. It is a cross between a Minneola tangelo and a clementine mandarin. Since Minneola is a grapefruit-tangerine hybrid, Page is actually 3/4 tangerine and 1/4 grapefruit. This is a great choice for fresh juice lovers. The tree needs a pollinator (Dancy or Valencia) to perform well. It has dense foliage, is very ornamental, few or no thorns, intermediate fruit position, and a round headed tree.